Why do business in Sri Lanka now? 1st class sleeper. 1st class sleeping-berths are available on a few overnight trains. The cars have lockable 2-berth compartments with separate toilet and washbasin. Bedding is provided. 1st class observation car. The 1st class observation car is highly recommended. 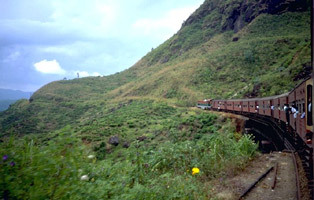 It's available on the best daytime trains on the amazingly scenic route from Colombo to Kandy and Badulla. The observation car is normally at the rear of the train (occasionally behind the locomotive) and has comfortable (if slightly grubby) armchairs facing a large window looking back along the track. Seats must be reserved before departure. Seats can be reserved within 10 days of departure, but book early as the observation car is very popular and gets booked up fast, especially during school holidays. 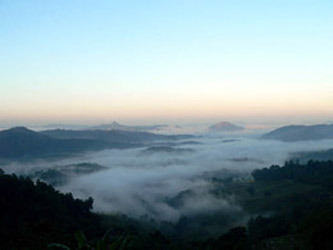 You can reserve from outside Sri Lanka via www.reddottours.com. 1st class air-conditioned seats car. Only available on one or two InterCity Express trains between Colombo & Vavunia and Colombo & Batticaloa. 2nd class seats, available on all trains. These come in several versions, depending on the train: (1) unreserved seats, where you buy a ticket, hop on and sit in any available seat, (2) reserved seats where you must make a reservation and you get an allocated seat, and (3) reserved 'sleeperette' reclining seats which are available on most overnight trains and recline to about 45 degrees for sleeping. 2nd class seats are the recommended option on trains with no 1st class. 3rd class seats, available on most trains. These come in several versions, depending on the train: unreserved seats, reserved seats, and reserved 'sleeperette' reclining seats. 3rd class is very basic and gets very crowded, and it is not generally recommended for visitors. New luxury 'ExpoRail' carriage: One train a day from Colombo to Kandy and back now carries a privately-run deluxe car with special fares, see www.exporail.lk. The timetables on this page show the principal trains on the most popular routes. 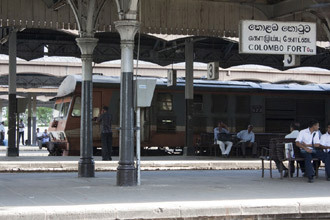 There are many other trains, stations and rail routes in Sri Lanka, but note that trains no longer operate to Jaffna or Talaimannar. You can check routes and train times at the new Sri Lanka Railways website, www.railway.gov.lk. There is also train information at www.slrfc.org/sri-lanka-railways-time-table.html or www.reddottours.com. 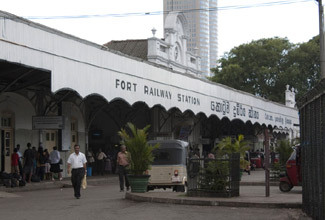 You cannot book online*, but it's easy to buy tickets when you get to Sri Lanka, there is a special ticket window for tourists at Colombo Fort station. Reservations for trains with reserved seating such as InterCity Express trains open 10-14 days in advance. Other trains (shown as having 'unreserved' seats) don't require a reservation, you just buy a ticket on and hop on. 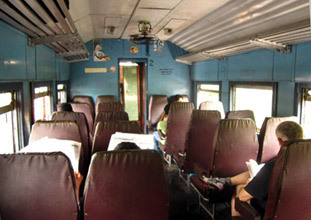 Seats in the 1st class observation car from Colombo to Kandy can get fully-booked from time to time, so book a few days ahead if you can, but you may well find seats available on the day of travel. If you really want to pre-book a train before you get to Sri Lanka, and are prepared to pay a booking fee, try contacting a local travel agency or even asking your hotel to arrange tickets for you. If you want to book some hotels or tours as well as train tickets, reputable agency www.reddottours.com will book train tickets for you if you're also booking £300 or more of other tours and accommodation with them. * The special deluxe 'Expo Rail' carriage Colombo-Kandy can now be booked online, at www.exporail.lk.